If your notion of William Randolph Hearst still revolves around a famous sled named "Rosebud," have I got a book for you. 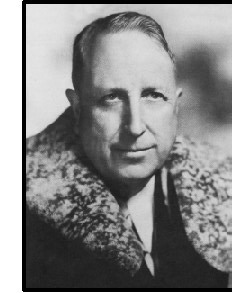 David Nasaw's biography The Chief: The Life of William Randolph Hearst deftly restores Hearst to a central place in the history of American culture and politics. This is a terrific read about an astonishing and exasperating demagogue of a man who re-invented himself more often than Madonna, and had the time to do it, his life spanning from 1863 to 1951. With his newspaper empire, mansions, castles, and his cavorting with Hollywood stars and heads of state, Hearst was larger than life. Nasaw's re-interpretation of Hearst is also a surprisingly positive and sympathetic one. ascended to the U.S. Senate, Will Hearst took over his father's newspaper, the San Francisco Examiner. The newspaper had never done very well, but Will quickly turned it around. He observed the latest trends in newspaper publishing, stealing ideas that seemed the most innovative. As Nasaw notes, the person to watch at the time was Joseph Pulitzer in New York, then giving birth to a new kind of journalism that appealed especially to working men and women. Hearst extended Pulitzer's strategy further. He developed sensational headlines and stories; he paid more attention to crime and to salacious stories of government corruption. He made the writing tighter and more colorful. He added more and higher-quality illustrations. And Will's paper was, in Nasaw's words, "defiantly pro-labor, anti-capital, and anti-railroad." It took the same positions that any white union man of the day would have. The Examiner strongly defended the right to unionize and strike, and fiercely attacked the presence of cheap Chinese workers, who allegedly stole jobs from Americans. But Hearst's paper stood up for the interests of European immigrants, building support among Italian and Jewish communities in particular. Within a few years Hearst had made his paper essential to white working people: "Like the workingman's saloon and the political clubhouse, Hearst's newspaper served as an unofficial public agency, an honest broker, and unpaid intermediary between the people and their government." These tactics would serve as Hearst's basic formula for success in the years to come. He gradually refined them and added an element of spectacle, using his newspapers to create news as well as report it. Although Nasaw nimbly analyzes and rejects the notion that Hearst pushed the United States into the Spanish-American War ("That Hearst has received so large a measure of credit or blame for that 'glorious war' is a tribute to his genius as a self-promoter"), he also shows how Hearst cagily benefitted from and exploited the war.